One of the most common questions we get from quilters and sewers involves how to organize fabric. Face it, most of us are fabric addicts. We just can’t seem to get enough. So, the issue we face is coming up with attractive, functional fabric storage. 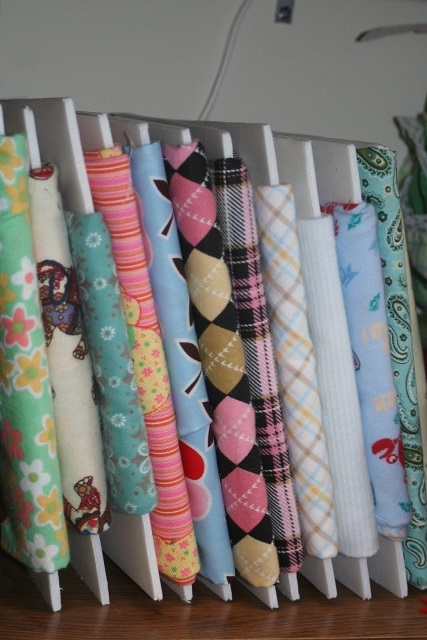 We looked around the web and found six unique, yet practical ideas for organizing fabric. 1. File it Away- Thinkingcloset.com came up with a unusual way to organize fabric. File it! This innovative sewer used acid-free Pendaflex file folders already on hand, cut them down the middle, draped the folded fabric over top, and loaded up the bottom drawer with files of fabric. 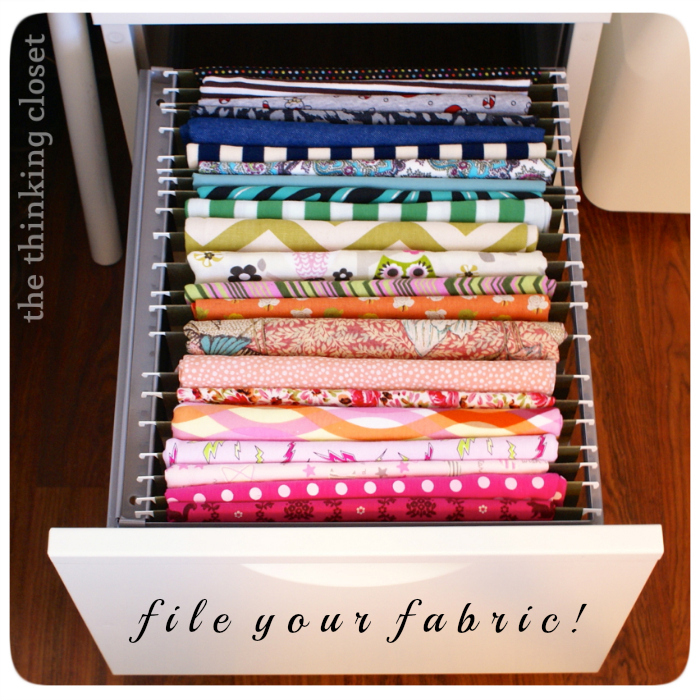 This blog shows you step by step how to make your own folders for fabric filing. 2. Put it on “Bolts”- Lots of sewers like to display fabric on bolts. We like this version from Prayer of Hannah.com that uses foam core, purchased from the dollar store. 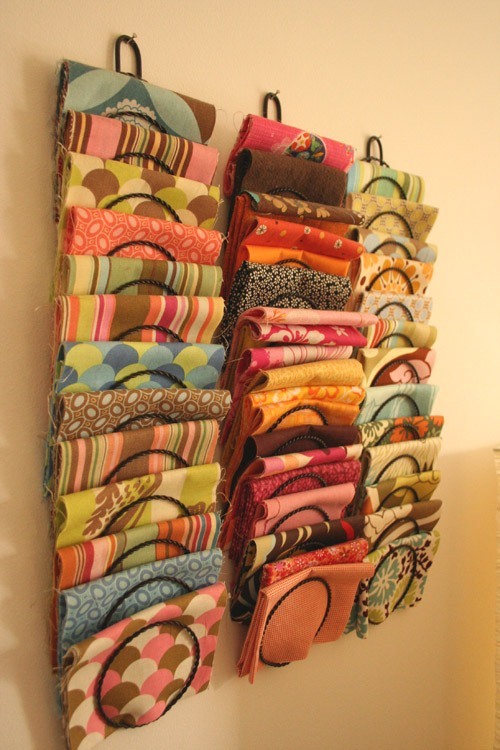 For just pennies, you can create your own custom sized fabric organizers with a craft knife. They look great displayed on a shelf. No more forgetting about what you have and how much you have. You can use a box cutter or a rotary cutter to cut the foam core, which is sturdier than cardboard. 3. Hang it Up- Linda, over at Craftholicsanoynomous.com, used a curtain rod and clipped curtain rings to display fabric, which remains wrinkle free since it is hung. Be sure to secure the rod into studs so it doesn’t fall since fabric can be heavy. 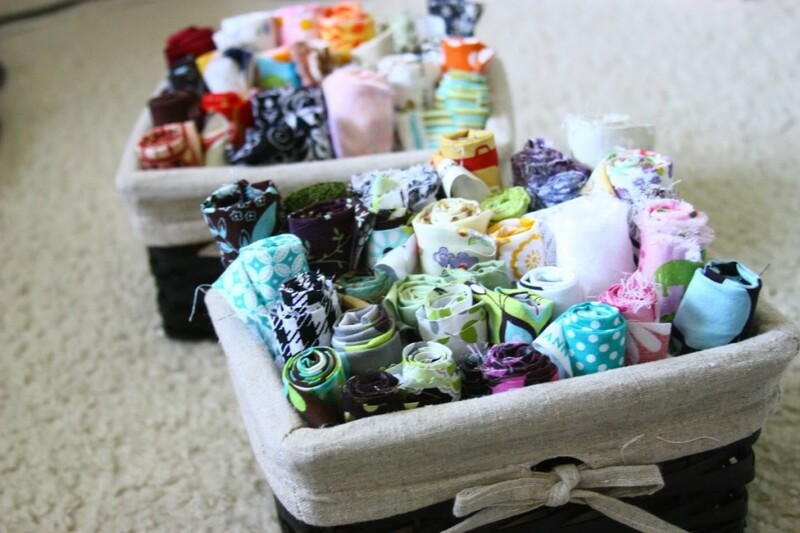 We like this idea for organizing smaller pieces of fabric. 4. Put it in a Basket- Gather smaller pieces of fabric and roll it. Use lined baskets to keep the scraps handy, arranging by color. These fabric baskets are handy and very visually appealing. 5. 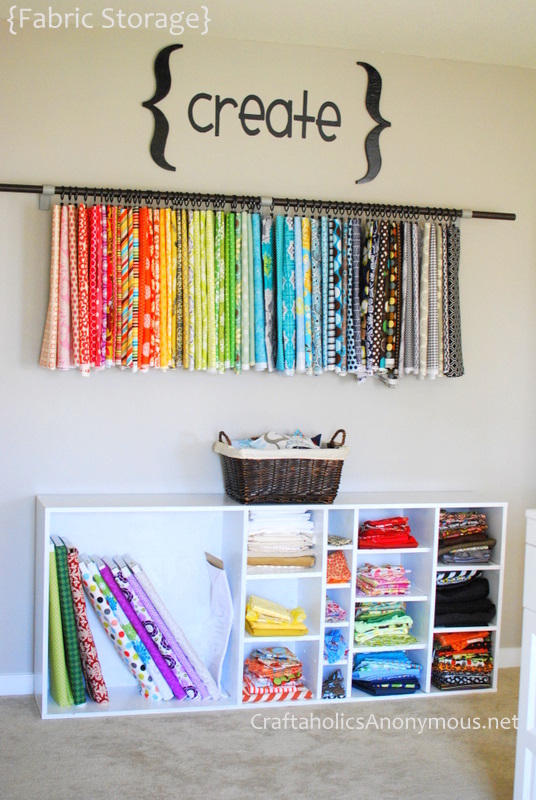 Sort it Out- Repurpose a letter sorter by displaying your fabric stash! This clever sewer hung three of the same sized letter sorters side by side and folded fabrics all the same way. How smart! 6. 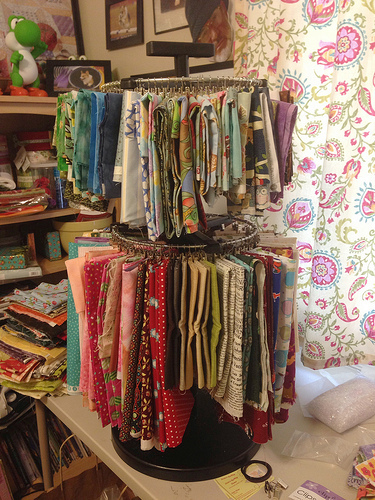 Clipped Fabrics- This system is perfect for organizing smaller pieces of fabric as well. If you have the space to devote to this circular file, these stands are attractive yet functional. 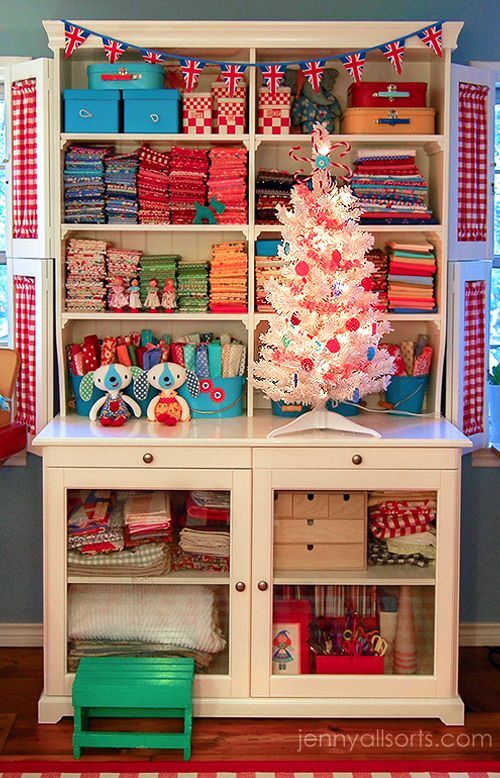 How do you organize fabrics? We asked some of our Facebook fans for some tips. Most of them commented that it helps to store the fabric along with the pattern and other supplies. “It helps me to keep the fabric and pattern together until I “get to it”. I started doing this after I accidentally used my background fabric for one project on another quilt and then had to buy more fabric”. – Tami P.
“I have my different projects in clear bins too along with the pattern if I’ve decided on one for the fabric.” – Jan S. K.
If you enjoyed this article, you might like our article on organizing threads. This entry was posted in Fabric, organization, QuiltWoman and tagged craftaholicanaynamous.com, fabric organization, prayer of hannah, QuiltWoman.com, thinkingcloset.com. Bookmark the permalink. I want to buy that…bt i can find it on any online sites…Please help me. One more thing. I think that there are numerous travel insurance web-sites of trustworthy companies than enable you to enter your vacation details and get you the prices. You can also purchase this international travel insurance policy on internet by using your own credit card. All you should do should be to enter all your travel details and you can see the plans side-by-side. Only find the plan that suits your finances and needs and use your credit card to buy the item. Travel insurance on the internet is a good way to do investigation for a dependable company with regard to international travel cover. Thanks for giving your ideas. But your website is not even in TOP 20 google’s search results. Love the hutch in the top picture. I plan to try the foam board idea as well as the letter holders! Thanks.